← New #esafety resource being developed for 4-7 year olds – Thinkuknow needs you! 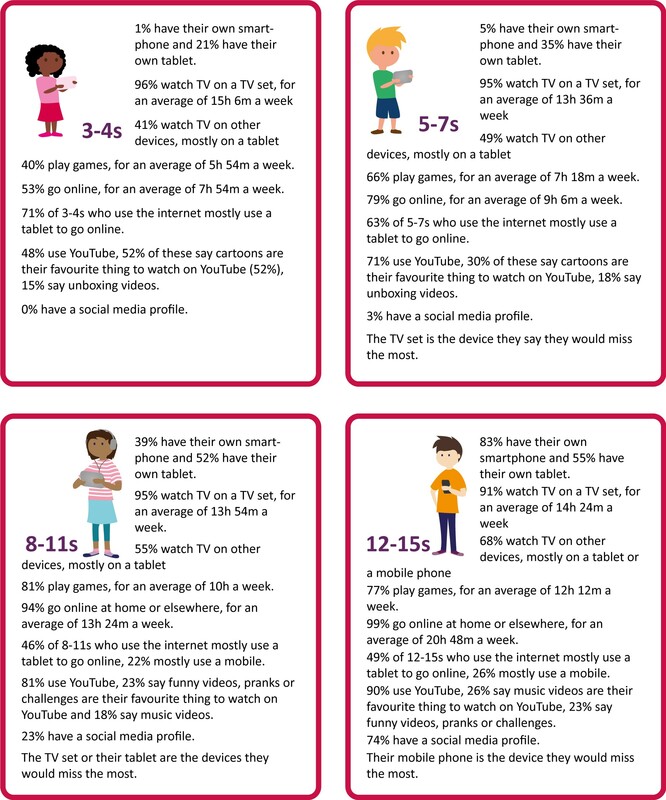 Ofcom have published their annual Children and Parents Media Use and Attitudes Report for 2017. The report examines children’s media literacy and provides detailed evidence on media use, attitudes and understanding among children and young people aged 5-15, as well as about the media access and use of young children aged 3-4. The full report can be accessed here; a summary is provided below based on content provided by Ofcom here. Schools and Early Years Settings may find the following content helpful when reviewing and developing their online safeguarding curriculum and when speaking with staff and parents/carers. More children are using the internet than ever before; 92% of 5- to 15-year-olds are online in 2017, up from 87% last year. More than half of preschoolers, 53% of 3-4s and 79% of 5-7s are online – a 12% rise on last year; much of this growth is driven by the increased use of tablets. Social media platforms are popular with younger children, even though most platforms require users to be aged 13 or over. More than a quarter (28%) of 10-year-olds have a social media profile, rising to around half of children aged 11 or 12 (46% and 51% respectively). There is low awareness among parents of minimum age requirements. Six in ten parents of children who use Facebook (62%), and around eight in ten parents of children who use Instagram or Snapchat (79% and 85%) either didn’t know there was an age restriction, or gave the incorrect age. Many parents choose not to apply minimum age limits. Aside from social media, one of the primary online destinations for children of all ages is YouTube, with eight in ten (81%) children aged 5 to 15 regularly using the site to watch short clips or programmes. Among older children, YouTube is the most recognised content brand; 94% of 12-15s have heard of it compared to 89% for ITV, 87% for Netflix, and 82% for BBC One and Two. Resources and links to share with parents/carers can be found on Kelsi. Half of children (49%) aged 12 to 15 who use the internet say they ‘never’ see hateful content online. But this year there is a higher proportion of children who have seen such content, from 34% in 2016 to 45% in 2017. More than a third (37%) of children who saw this type of content took action. The most common response was to report it to the website in question (17%). Other steps included adding a counter-comment to say they thought it was wrong (13%), and blocking the person who shared or made the hateful comments (12%). Resources to help children report online concerns can be found within the Kent Online Safety Policy Template and Guidance and Online Safety Classroom Resources page on Kelsi. More than half (54%) of 12- to 15-year-olds use social media platforms such as Facebook and Twitter to access online news, making social media the second most popular source of news after television (62%). The news children read through social media is provided by third-party websites; while some of these may be reputable news organisations, others may not. 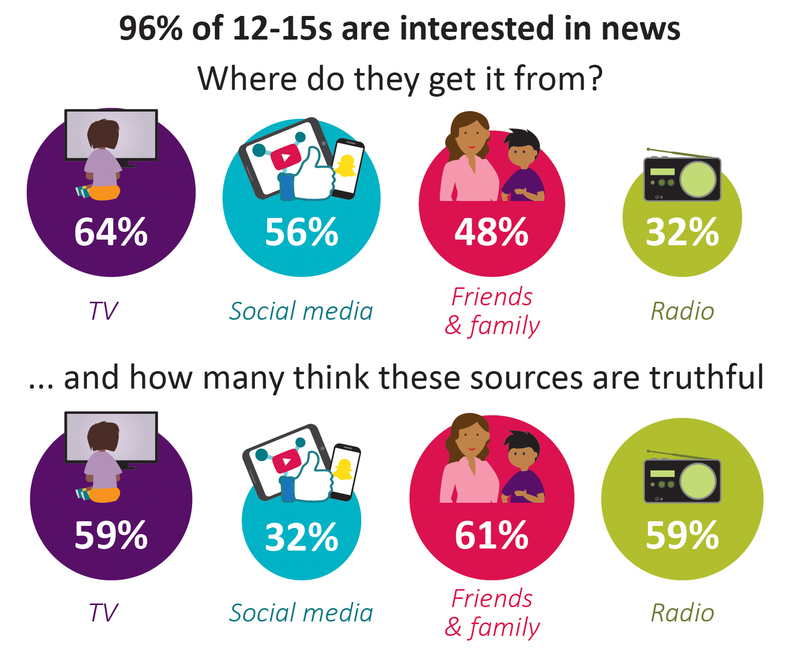 Many children are wise to this; 32% of 12- to 15-year-olds who say social media is one of their top news sources believe news accessed through these sites is always, or mostly, reported truthfully, compared to 59% who say this about TV and 59% about radio. 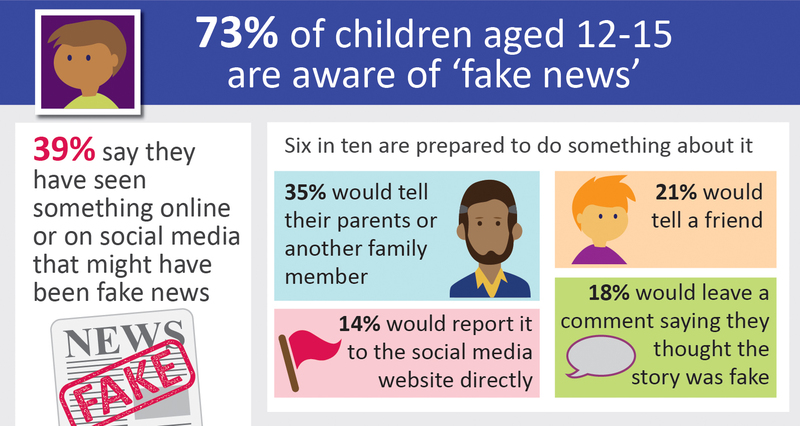 Nearly three-quarters (73%) of online tweens are aware of the concept of ‘fake news’, and four in ten (39%) say they have seen a fake news story online or on social media. The vast majority of 12-15s who follow news on social media are questioning the content they see. Almost nine in ten (86%) say they would make at least one practical attempt to check whether a social media news story is true or false. Seeing if the news story appears elsewhere (48% of children who follow news on social media would do this). 14% would report the content to the social media website directly. Some children still need help telling fact from fiction. Almost half (46%) of 12-15s who use social media for news say they find it difficult to tell whether a social media news story is true and 8% say they wouldn’t make any checks. Resources to explore ‘fake news’ issues in the classroom can be found on the Online Safety Classroom Resources page on Kelsi. The research shows that most 8- to 15-year-olds believe there are enough programmes on television for children their age, and that the content suitably reflects their lives. Some 8- to 15-year-olds disagree; one third (35%) of 8-11s who watch TV say that not enough programmes show children that look like them; while 41% of 12-15s say too few programmes show children living in their part of the country. Building on this research, Ofcom has launched a Review of Children’s Content and will examine the range and quality of children’s programmes across TV broadcasters and content providers, and highlight any areas of concern. This entry was posted in 2017, Children and Young People, Ofcom, Research and tagged 2017, Age limits, Children and Parents Media Use and Attitudes Report, Fake News, Ofcom, Research, Statistics, UK. Bookmark the permalink.